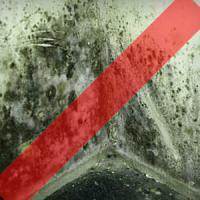 This disease has an incidence of 3% to 8% among the population. 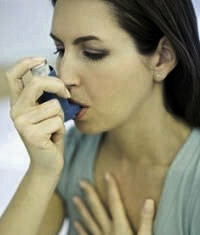 Some 100 to 150 million people worldwide suffer from asthma, with more than 180,000 deaths per year. Most asthma deaths occur in people over 45 years old, and 40% of patients are aged over 75. Worldwide, the economic costs associated with asthma exceed those of tuberculosis and HIV / AIDS combined. Asthma is an obstruction of the airways characterized by inflammation and hyperirritability thereof. Inhalation does not cause substances which effect on normal individuals may cause bronchoconstriction in asthmatic patients. So asthma does not cause emphysema or other chronic diseases, but alone can be a major cause of disability. An important characteristic of asthma is the extreme variability of both patient to patient and in the same patient at different stages. To this day no one knows for sure how (or why) a person acquires asthma. It is known that, once acquired, the lungs can react to stimuli that can trigger attacks, or exacerbations, or attacks of Bronchial Asthma. In general, these attacks of asthma begin or are "triggered" by something that attacks the lungs. These agents are called asthma triggers. 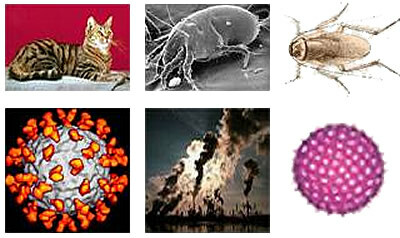 The attacks of asthma may be caused by several factors such as allergens (particularly inhaled or aeroallergens: house dust mites, pollens, animal epithelia, fungi), bacterial or viral infections, occupational agents (dust textiles, timber, grain, volatile paints and adhesives), and tobacco smoke. All these stimuli are inducers of exacerbations, and in addition to causing asthma attacks, frequent exposure to such stimuli may aggravate the chronic inflammation of the airways and increase disease severity. Chemical irritants, emotional factors, physical activity and exaggerated reaction to certain medications (such as beta-blockers, aspirin or indomethacin) are stimuli that trigger exacerbations, but do not aggravate the underlying inflammation. Because of this wide variety of causes, it can be very difficult to deduce what exactly has caused the attacks of bronchial asthma. However, once discovered the triggering factor of asthma, something must be done to prevent future attacks, which allows some control over the crisis. Asthma is not a hereditary disease, although there is a genetic predisposition to the disease. The risk of childhood asthma is related to the presence of disease in the parent. If one parent has asthma, the risk of children developing asthma is 25% if both parents are asthmatic this probability increases to about 50%. However, the fact that parents do not have the disease does not mean that the child can not develop it (there is a probability of about 10%). Extrinsic asthma (Allergic shape): the asthmatic episode is initiated by a hypersensitivity reaction type I (immediate) induced by exposure to an extrinsic antigen inhalation. 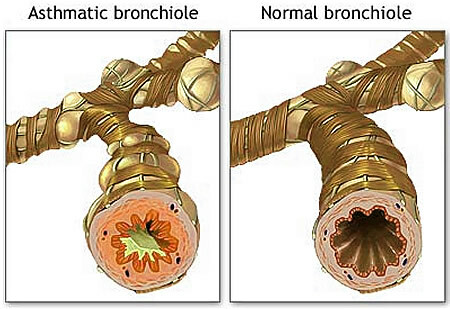 There are three recognized types of extrinsic asthma, occupational asthma, allergic bronchopulmonary aspergillosis (bronchial colonization by Aspergillus organisms followed by development of antibody immunoglobulin E [IgE]), and atopic asthma (most common type, usually begins in the first two decades of life, and is commonly associated with other allergic manifestations in the patient and other family members). Intrinsic Asthma: mechanisms triggering are non-immune. Various stimuli can initiate a bronchospasm, including aspirin, lung infections (mainly caused by viruses), cold, psychological stress, exercise and inhaled irritants such as sulfur dioxide. However, it should be emphasized that due to the inherent bronchial hyperreactivity, with an individual extrinsic asthma the patient is also susceptible to the development of an asthma attack when exposed to one of the agents mentioned. Thus, in many cases it is not possible to distinguish between pure intrinsic and extrinsic asthma. It is the occurrence of an immune response in an exaggerated or inappropriate form. It can be caused by various types of antigens and its cause varies from individual to individual. Hypersensitivity does not manifest in the first contact with the antigen, for this to happen there must be the first sensitization. It occurs when an IgE-mediated immune response is directed against environmental antigens, such as mites, house dust, animal dander and pollen. Mast cells bind IgE. The subsequent connection to an allergen induces mast cell degranulation and mediator release which produce allergic reactions. The patient with asthma can measure the degree of airway obstruction, and thus measure the degree of symptoms, helping the doctor to treat. 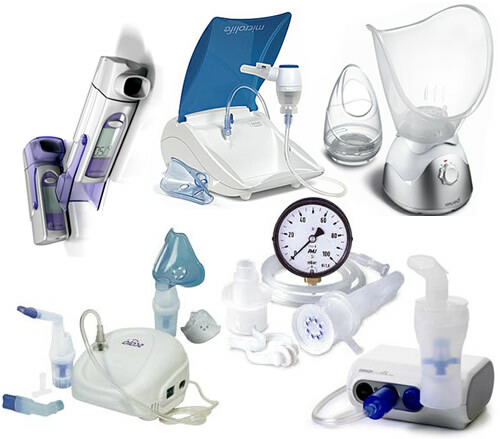 A far easier way to measure airway obstruction is through a device called PEF (peak expiratory flow). Related to this unit, there is a table with the values considered normal for age and height of the patient, but the ideal is to discover what the normal value of each. Thus it is recommended to calculate a resultant average of values obtained by EPF for 20 days (with measurements taken in the morning and evening). In addition there is a classification for the disease at different levels, there is also a simple and practical way of classifying asthma attacks. Thus, classification is made on: mild, moderate and severe attacks. Slight change in PEF (> 80% expected). PEF 50-80% of normal patients. Mucosal edema, with increased inflammation. 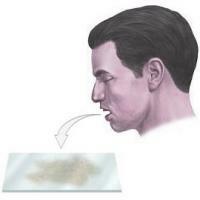 The responses to these stimuli cause airway obstruction by decreasing its size and accumulation of mucus. 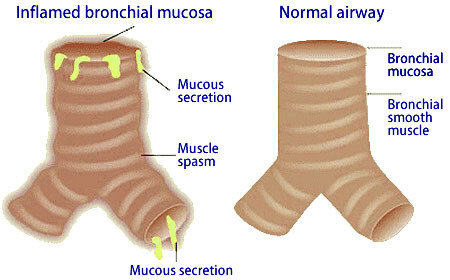 The airway muscles contract, particularly the sphincter of the bronchi. Asthma is a chronic inflammatory condition of the airways, causes of which are not completely understood. As a result of inflammation airway becomes narrow-reactive and easily responsive to various stimuli. This can result in coughing, wheezing, chest tightness and breathlessness, which are most common symptoms at night. The narrowing of the airways is usually reversible, but in patients with chronic asthma, the inflammation can determine irreversible airflow obstruction. The pathological features include the presence of inflammatory cells in the airways, plasma exudation, edema, muscle hypertrophy, mucus plugs and epithelial desquamation. Physical examination: typically reveal tachycardia, tachypnea with prolonged expiration, excessive inflation of the chest with little movement of the diaphragm, and diffuse and acute expiratory wheezing. Analysis of sputum, purulent sputum may appear due to the higher concentration of eosinophils or an inflammatory response to viral tracheobronchitis. The sputum smear may reveal Cushmann spiral (i.e., mucus which forms a mold in the small airways) or Charcot-Leyden crystals (i.e., degradation products of eosinophils). Hematological studies show the presence of leukocytes and eosinophils as well as the intrinsic shape of allergic disease. Pulmonary Function Tests: all tests can be changed. The functional residual capacity (FRC) is increased, a second forced expiratory volume (FEV) is decreased, the ratio FEV / FVC is reduced but may improve after inhalation of a bronchodilator. The residual volume (RV), total lung capacity (TLC) and lung compliance are usually increased and often there is an increase of the diffusion of carbon monoxide. After symptomatic recovery TLC and lung compliance return to normal, but the maximum expiratory flow rate can stay low at low lung volumes, and abnormal distribution of ventilation may persist, reflecting strong obstruction of small airways. Chest radiograph: in general only reveals excessive inflation. Occasional findings include localized density due to a large mucus plug and the dark signal of pneumothorax or pneumomediastinum, reflecting the alveolar tissue disruption caused by high intra-alveolar pressure. Arterial blood gas, the partial pressure of carbon dioxide is generally low (less than 36 mmHg). The partial pressure of carbon dioxide increases or stays normal (40 mmHg) indicating severe obstruction. The arterial hypoxia is common despite the increased ventilation and results from the sub ventilation of pulmonary segments supplied by narrowed airways. For the physical therapy there are two phases of treatment: asthmatic crisis and inter-crisis period. The patient appears very tense and anxious, thorax blocked in inspiratory position, rapid uncontrolled breathing, predominantly upper costal at the expense of accessory muscles of inspiration, complaining of "breathlessness" and "squeak" in the chest, feeling of "chest tightness". Attempting to combat anxiety, seeking a progressive relaxation of the upper chest, shoulder girdle, encouraging an abdominal-diaphragmatic breathing. 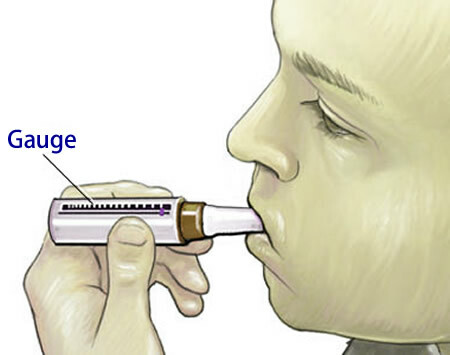 During the crisis you should not try to modify the respiratory rhythm or apply techniques to expectorate, as there is danger of serious bronchospasm. Relaxation massage (neck and shoulder girdle). Acquisition of control of breathing and preparation of the patient for a possible crisis. Correction assinergias and ventilatory defects. Easing backpack (with a higher incidence in the sense expiratory). Teach the patient to inhale through the nose and breathe abdomino-diaphragmaticly directed to apply during the crisis. Advice to the patient in case of crisis. Acute attacks of asthma can start as if it is a simple cold. The most common manifestations of the disease are coughing, wheezing and breathlessness, dyspnea, and tightness of the chest. The symptoms of asthma are related more to the expiration process for their obstructive nature. The manifestations vary from case to case and depend on the intensity of the disease. In a severe attack of asthma, breathing becomes increasingly difficult and accompanied by sweating, tachycardia, distress and anxiety. The patient can not lie and may not be able to speak and breathing becomes rapid and panting. In a fit of extreme gravity the low oxygen content in the circulating blood can cause cyanosis (bluish color) on the face and especially lips. The skin becomes pale and sweaty. These symptoms can be fatal. During crises the following drugs are contraindicated: sedatives, tranquilizers, mucolytics, especturantes. The term "status asthmaticus" is generally reserved for a severe and prolonged asthma attack unresponsive to treatment and involving bronchospasm so severe that the patient is at risk of developing respiratory failure. Although there is no cure for asthma, most exacerbations can be prevented. Extrinsic asthma sufferers may take tests aimed at detecting whether the attacks are triggered by any of the most common allergens agents. If a specific cause is discovered several measures can be taken to prevent it. For example, if the asthma attacks are triggered by pollen, the patient should avoid gardens and trips to the field during the spring. You can appeal to the desensitization (a series of injections of the allergen agent), although the results are not always satisfactory. The prophylactic drugs (preventive) proved much more effective in preventing attacks, among them the anti-allergic substances (antihistamines, cromolyn sodium) and inhaled corticosteroids. However, to be effective, they must be administered several times daily, typically with an inhaler. Provide washing clothes in hot water at levels adequate to remove the bedding dust mites and reduce the overuse of cleaning products that hold the smell in the tissue. Never take medications that are not prescribed by doctors. The effective treatment of asthma is based on four basic components: objective measures of pulmonary function, drug therapy, measures to control environmental allergens and irritants, and patient education. Asthma is a disease which, without curing, can be controlled. There are basically two types of drugs that are used in the treatment of asthma: the preventive, or anti-inflammatory, and bronchodilator, or relievers. The preventive or anti-inflammatory drugs are those, which treat the cause of asthma, inflammation of the bronchi. The relievers, or bronchodilators, are those, which are the consequence of asthma: the narrowing of the bronchi, acting on the muscles of the bronchi and causing relaxation of them. 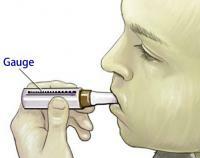 Thus, in acute cases, drugs that open the bronchial tubes are rapidly employed - bronchodilators. These can be conveyed through "firecrackers" or pressurized sprays. These drugs must be used only as drugs for redemption, i.e., when acute attacks of breathlessness. Asthma is considered an inflammatory disease. It must therefore be treated with anti-inflammatory. We use the anti-inflammatory from mild asthma to persistent, even when the patient is out of crisis (without dyspnea), as yet is known that there is inflammation. Leukotriene modifiers: As for children over 6 months, when orally and may be administered in combination with inhaled glucocorticosteroids, when these alone do not control the disease. My daughter was diagnosed with atopic asthma and has been ill for 3.5 years. Frequent attacks (2-3 times per week), lying in the hospital each year, at the beginning it becomes easier but not for a long time (1-2 months of quiet life and then attacks start again ), there are almost no attacks in summer, but when it gets colder, it all starts again. I don’t know what to do, please help me. Maybe I should refer to other professionals (but where?? ), get tested, and can you explain to me what a molecular diagnostics may show ? Maybe it is not asthma? Hello, from time to time I wake up from lack of the air, or, when I am fast asleep, I involuntary stop breathing for a moment. The fееling is awful. What can it be? I hope it is not asthma.Thanks in advance. I constantly have to drink Dexamethasone, Corvalol, Aminophylline and make injections of Sulfakamfokain, the action extends to a maximum of two weeks and then I have to take more drugs for treating bronchial asthma. I've heard that there is a cure for asthma, when you can be injected only once, and the effect lasts half a year. Can you tell me what are the other ways?